Adding a sliding door between rooms can be easier than you think! Follow this photo tutorial for how to build yours from scratch and you'll have a little more privacy—and a little more style—in just a weekend. 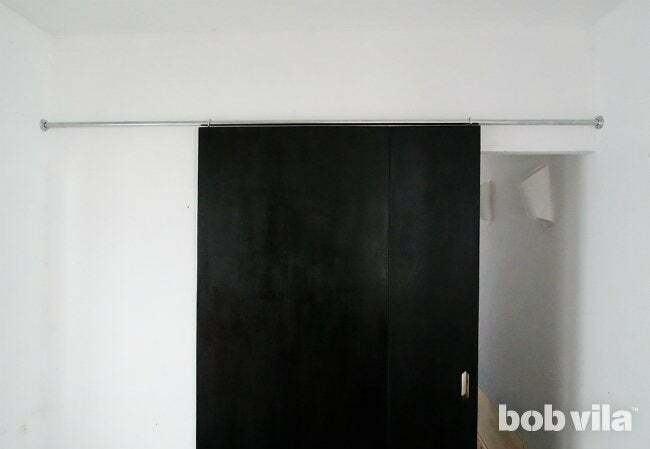 When you have a doorway but not enough room for a door to swing open, oftentimes the frame goes without any sort of covering—or, worse, a temporary curtain divider that hangs there for a not-so-temporary amount of time. Fortunately, homeowners hoping for a little more privacy or a way to hide a closet’s contents have a better workaround that still involves a curtain rod: mounting a slim sliding door. This sort of installation easily distinguishes living areas while also providing a modern, even industrial, touch. Check out this problem-solving tutorial—adaptable to all doorway sizes—that will leave you with the separated spaces that you crave. 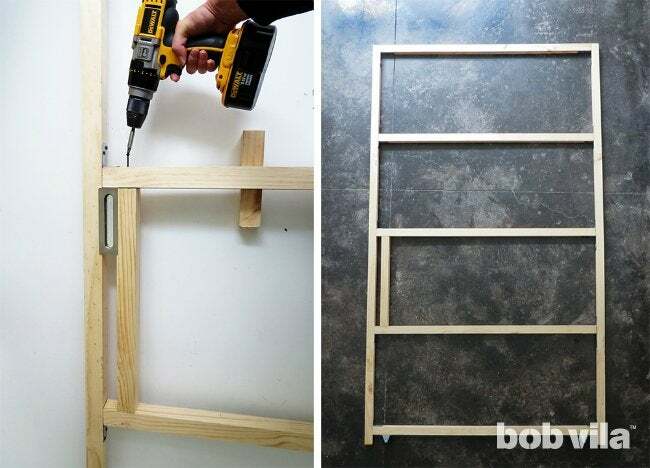 You first need to build the DIY sliding door frame using 2×2 lumber. 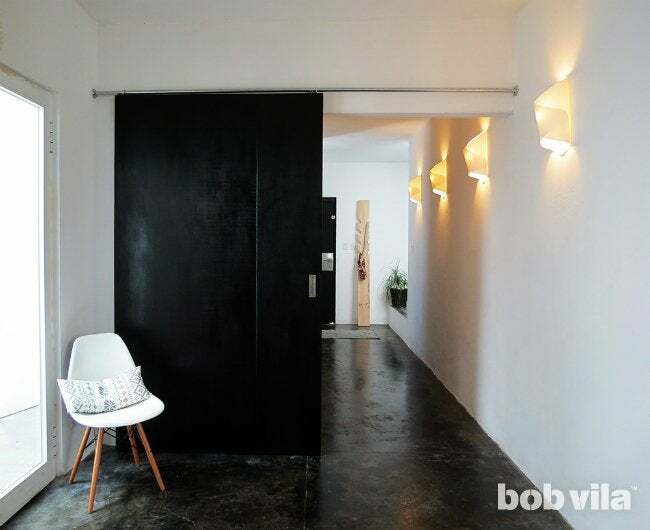 Dimensions for your build will largely be dependent on the size of your doorway, so that the sliding door is big enough to cover the entryway and then some. We added 2 inches to the width and the height of the doorway dimensions to determine what size to make our door. Lay the pieces out as pictured above, placing one crosspiece at the top, another 1 1⁄2 inches from the bottom, and the other three spaced so that they are equidistant (likely about 20 inches apart). 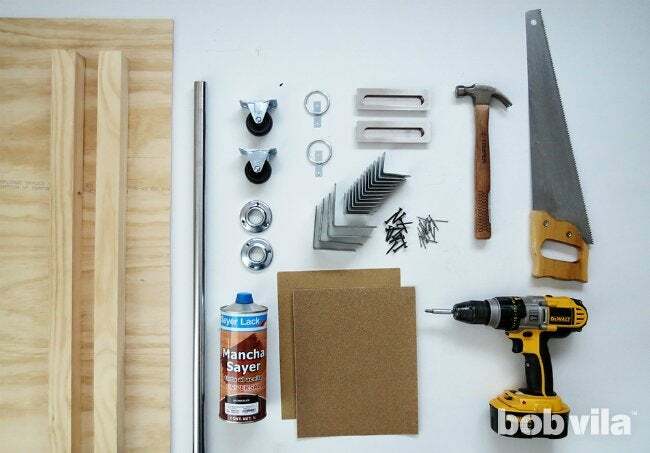 Assemble all the wooden pieces together using 1-1⁄4-inch metal corner braces. 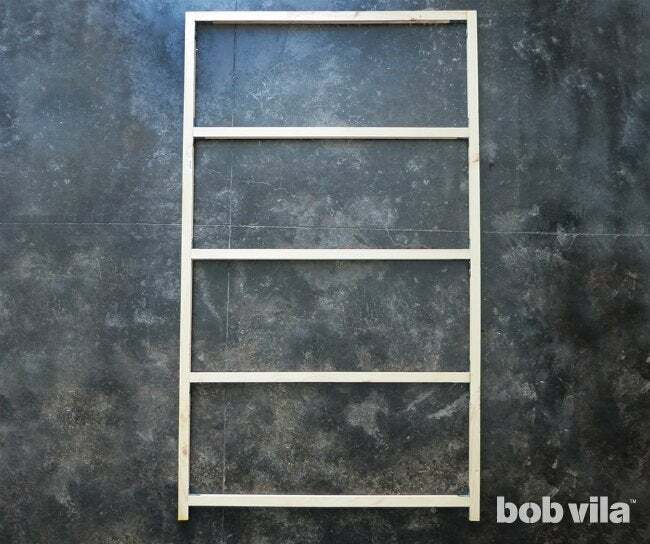 Screw a brace in each corner of the frame—four in each rectangle and two more at the very bottom—in order to make your structure extra sturdy. 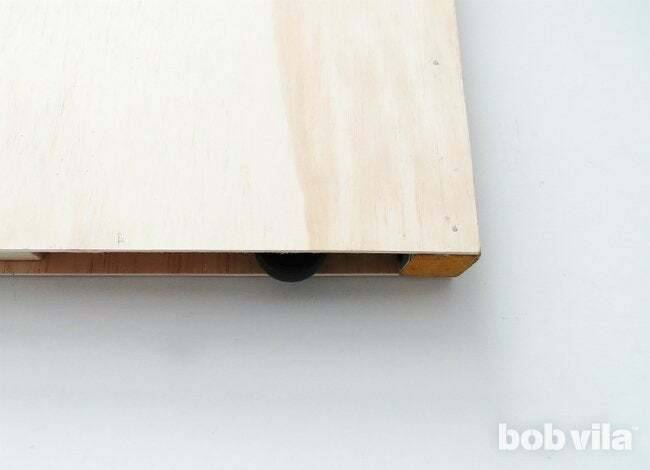 Double-check the measurements on the bottom crosspiece before screwing it in place: It must be 1-1⁄2 inches from the bottom of either vertical post so that you can fix the casters inside the frame and later hide them behind the plywood board. Screw the 2-inch rubber casters on the bottom crosspiece, one just inside the corner brace on each side. You must strengthen the framework right where the door pull will go, because this side will get a lot of tugging to open and shut your wheeled door. Measure the distance between the 2nd and 3rd crosspieces from the bottom, and cut this length from your remaining 2×2 lumber. Position this freshly cut vertical piece in the second rectangle from the bottom, where you just measured, leaving enough room from the outer edge to fit the metal door pull. Screw through the horizontal pieces to hold it in place, and then your framework is complete! Cut your two sheets of plywood (usually available in 4 feet wide by 8 feet long) into the exact dimensions of the wood frame, which will also be the dimensions of your DIY sliding door. One will cover the front of the frame, and the other the back. Most big-box hardware stores will make the cuts for you right at the time of purchase! Place one board on the wooden frame and mark the pull’s location with a pencil. 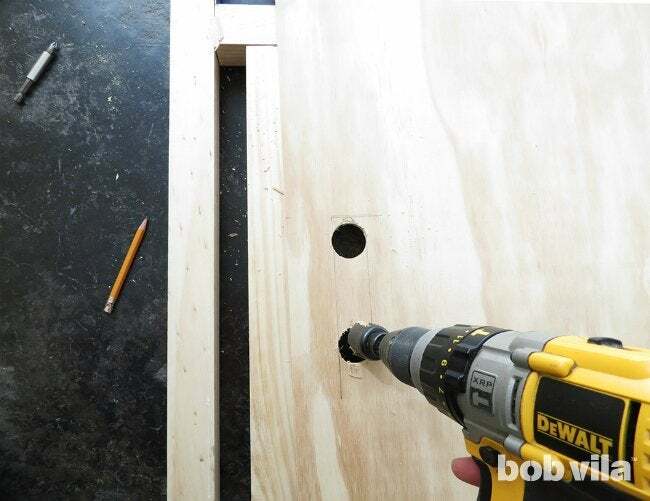 Use a drill and a jigsaw to cut out a hole to fit the recessed door pull. 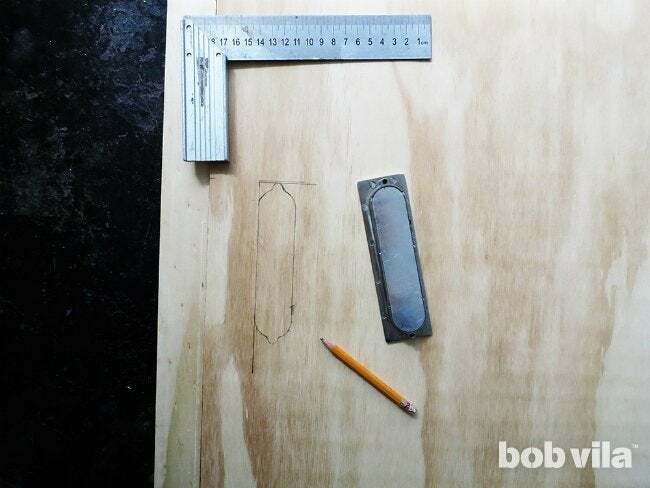 Then line up your two plywood boards, trace the hole, and cut out a hole on the second board for the other door pull. Next, glue one of the plywood boards onto the frame. 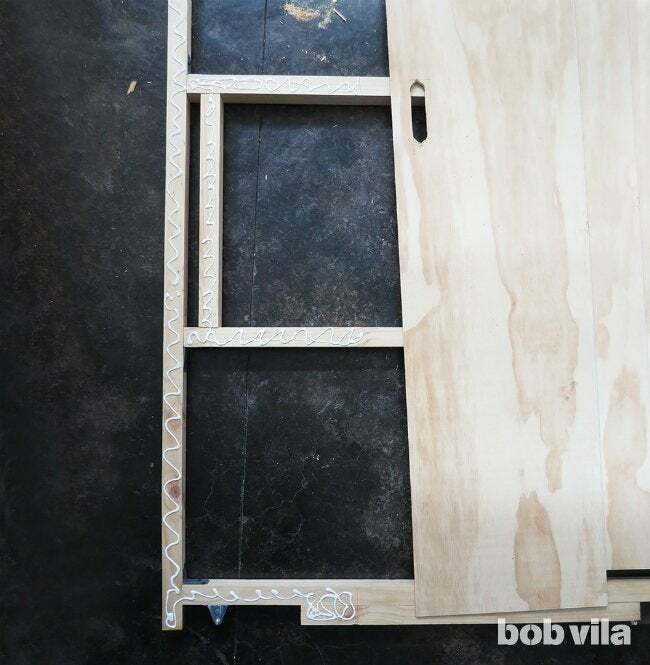 Cover each 2×2 with wood glue, hover the plywood over it to see that the side with the door pull’s hole lines up with the side of frame that is reinforced, then lower and clamp. Leave the clamps in place for as long as the glue specifies that it needs to cure. 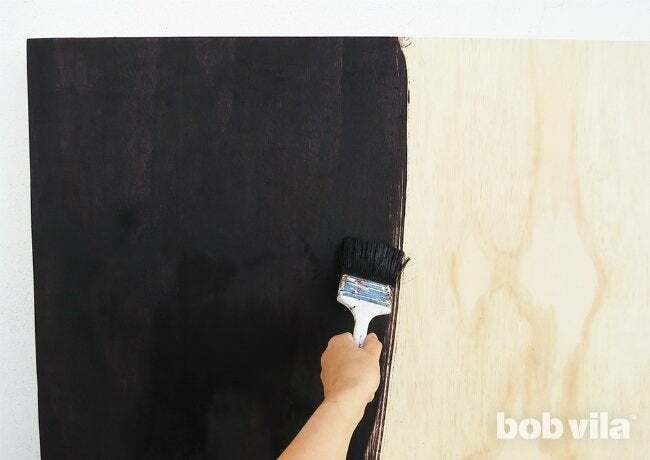 After the glue dries completely, turn the DIY sliding door over and do the same for the other side. Remove the clamps once all of the glue has dried and check if the plywood boards have adhered to the wood frame. You should see that the casters are now completely embedded in the door, partially covered by the plywood board. 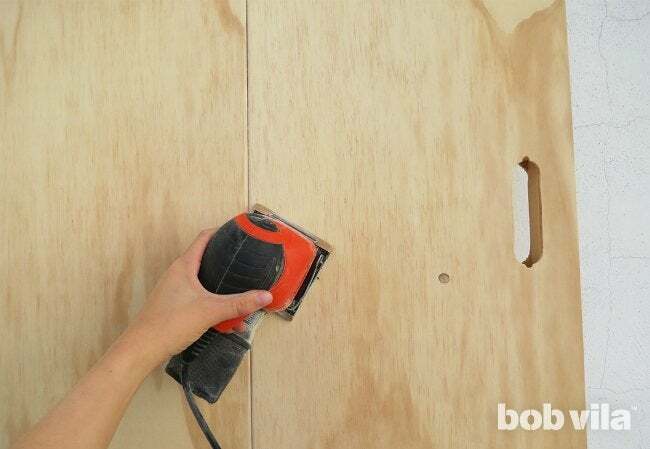 Take a palm-sander to completely smooth the DIY sliding door, especially the edges. Time to give the DIY sliding door its finished look! We’ve stained ours with a dark chocolate shade, but you can choose any stain color (or, alternatively, paint!) to complement your space’s scheme. After the stain dries, follow with a coat of varnish. Fit the door pull into the spaced carved for it, adhering with wood glue. Screw the hitch rings on the top of the door, one an inch from each end. Finally, stand your door and prepare to slide it into position. 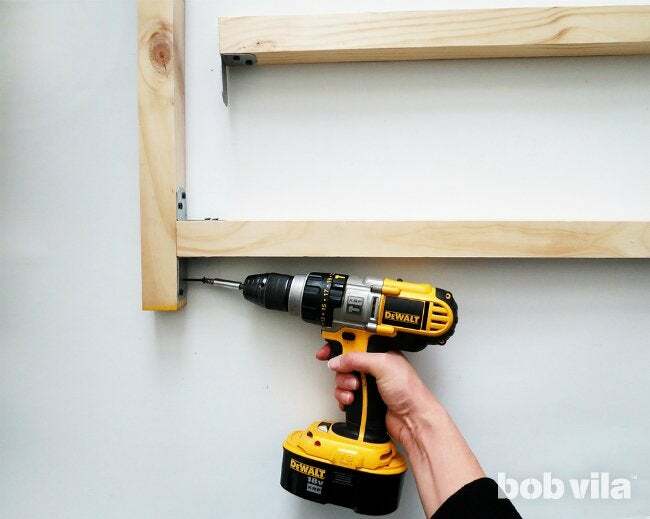 You’ll want to ask a partner for help holding the DIY sliding door while you put it on its “track”—a wall-mounted curtain rod. Here, our curtain rod spans wall to wall. But if that’s not the case with your kit, pick up a couple of curtain rod brackets to fix it to the one wall with the doorway. 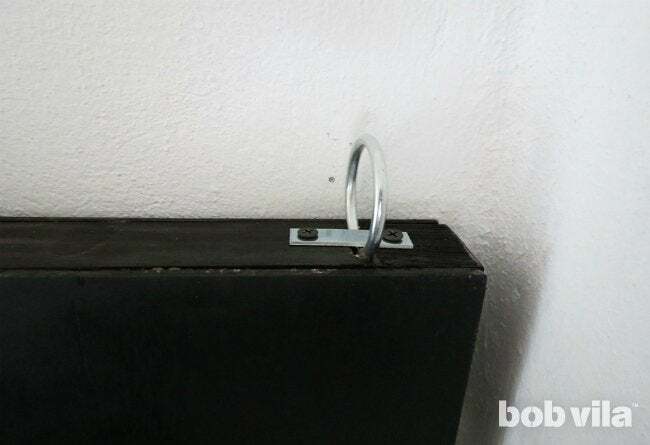 First, slide the curtain rod through the door’s rings, then push the door toward the wall so that its close enough for the curtain rod to mount but with enough room for the door to wheel back and forth. The DIY sliding door should be standing straight (not leaning), with full weight resting on the casters rather than pulling on the rod—that’s only there to guide the door. 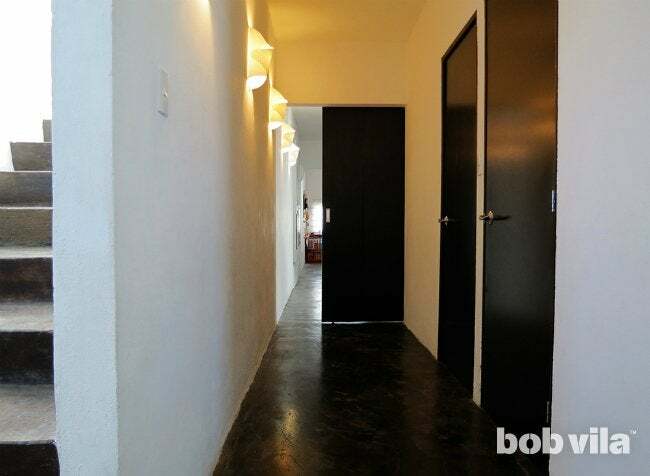 Now, check that the rod is perfectly horizontal and mark where it meets the wall. (This is where a partner comes in handy!) 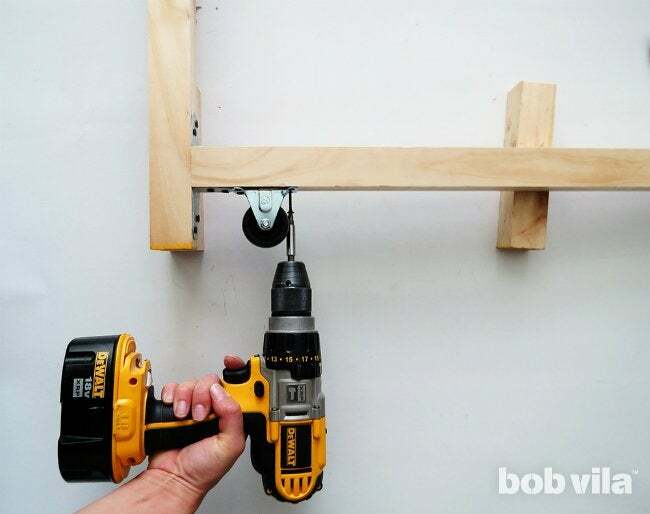 Screw the rod to the wall, and this project is an open-and-shut case.